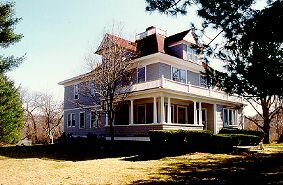 The Haddie Pierce House is a turn of the century Victorian located in the historic New England fishing village of Wickford, Rhode Island. The three story home, complete with widows walk, is a few minutes walk to the beach on Narragansett Bay, or the shops and boutiques of the village. Guest accommodations include restored rooms with private and shared bath. All are light and airy with comfort and cleanliness a priority. The double parlor with its parquet floors, antiques and period furnishings, provide a welcome respite for any traveler. Bed and breakfast room rates range from $85 to $95 per night. A hearty breakfast is served each morning and tea is always available for sipping on the front porch. Visa, Mastercard, Discover accepted. This and other Narragansett Bay Bed and Breakfast Inns can be found here in The Register.